Once upon a time, I thought of myself as a poet. I began writing poetry in my teens (one early effort considered the Kennedy assassination as appropriate subject matter) and filled many notebooks with my self-conscious scribbling. I was single-minded in my determination to be published, too. I gathered around me a group of like-minded friends and was part of several writing groups throughout high school and beyond. I took creative writing workshops in university, including one with a Governor-General’s Award winner. I even did have a couple of poems published in some university magazines, but somewhere in my late 20s, my dream faltered. Until the web came along. If you look carefully, you can still find a link to some of my work on this site, but it’s mostly a remnant of my original “homepage” from 1997, and not much has been added since then. Instead, my writing ambitions turned toward a more journalistic style. I spent a couple of years writing book reviews and some other light technology pieces for online publications like CanadaComputes.com (now HUB Digital Living) and Digital Web. There is even a link to a section on that work, if you search for it. The truth is that writing has always been important to me. And although I’m not writing as much as I would like these days, it’s not like I have an excuse. This very weblog has allowed me to publish more than a thousand entries since its genesis in 2000. The web has allowed all of us to write and publish for audiences that range from a few family members to thousands of paying “micropatrons”. But how has this publishing explosion affected the “other” publishing world? You know, the dead-tree guys? My buddy Kevin Smokler was sick of hearing about the “death of publishing” for which the internet was supposedly responsible. So he went out and rounded up more than two dozen actual dead-tree writers to prove that it’s just not true. The result is an enlightening and entertaining look at how a new generation of writers has come of age in the “digital” era. My favourites among the 24 essays include the one where Paul Collins reads through 121 years of the proto-blog “Notes and Queries”, and the one where Neal Pollack discovers fan fiction written about himself. Also, the one where Nell Freudenberger talks about reading her short stories to students in China while reading her father’s teenaged journals from his trip to Communist Yugoslavia and Hungary. And the one that alternately mocks and adores the Eggers/McSweeney’s/Believer magazine cabal. Oh, yeah, and the one where Glen David Gold confesses to Googling himself obsessively. Meghan Daum’s essay about the vocal tics of the NPR set was interesting (though it would have made more sense as a spoken word piece), and Pamela Ribon’s tale of how she accidentally became a “real writer” kept me smiling and reading. There were a few dead spots, though, mostly the stuff about whether an MFA in Creative Writing was a useful detour or not. In fact, the pieces I liked the most had the least to do with writing as an academic subject. Overall, the book has a higher-than-average ratio of good essays to not-so-good. It will give you an idea of the current state of the “writing life” and will bring you optimism where you may have been feeling none. If anything, there is more writing (and more importantly, more publishing) going on than ever before in human history. The challenge to come will be to filter through all this information to find the writers that are truly gifted and to help them use these new tools to reach audiences that they never could have imagined in the last century. Kevin’s book has shown that writers are finding a way. 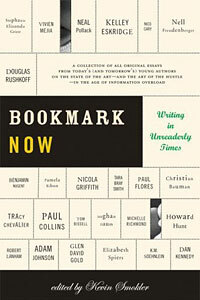 In fact, they are finding many ways, and that makes Bookmark Now an essential read. Even if it is printed on dead trees. Note: Kevin is taking his book on a Virtual Book Tour this week. He’ll be guest-blogging in a few places and doing other author-type stuff. Be sure to check out some of the other stops.